Waltham Fields Community Farm aims to distribute over $40,000 worth of organic vegetables each year. Our organization’s tagline is Local Food for All, as we believe strongly that all people, regardless of income, should have access to fresh, organic vegetables as the basis of their diet. Since its germination in the fertile minds of an idealistic crew of gleaners in 1995, Waltham Fields Community Farm (WFCF) has distributed hundreds of thousands of pounds of organically grown produce to over 25 agencies within local communities. Our hunger relief efforts provide bushels of fresh produce to soup kitchens, food pantries and shelters supplying healthy nourishment to people in need. Often, WFCF vegetables are the only source of fresh produce supporting the nutritional needs of these programs. WFCF continually works with the programs we serve to tailor our crop plans to better serve the specific needs of participant populations. 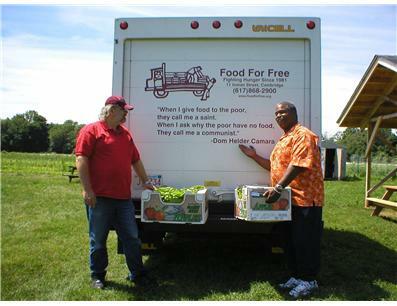 In 2008, we broadened our food access program to include a special Outreach Market in addition to our donation efforts. Partnering with several local organizations that we have run educational programs with, we brainstormed ways in which we could overcome the barriers of geography, cost and logistics that currently prevent low- to moderate-income families from accessing our food through our main distribution channels. The result is the Waltham Fields Outreach Market, which launched in the parking lot of the WATCH CDC (Waltham Alliance to Create Housing) in south Waltham and continues today. 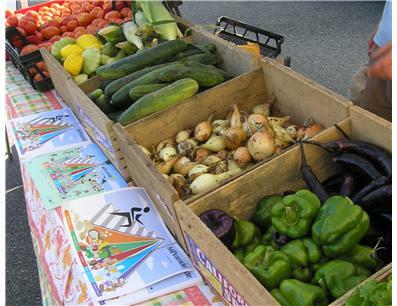 It is a once-a-week, subsidized market in Waltham, targeted to the clientele of several social service agencies, to whom we provide vouchers, as well as to residents in the neighborhood where the Market is strategically located. At the Market, customers can fill a paper grocery bag with vegetables for just $5 per bag, or in exchange for a voucher they acquired through our partner agencies. We initiated the voucher program with a core group of agencies that are still particpaitng today, including the JosephSmithCommunityHealthCenter, The Power Program, WalthamFamilySchool, and WATCH CDC, and we continue to add new agency partners and increase the number of voucher booklets distributed each year. Popularity of the market has grown steadily through the creation of the voucher program and publicity through local media channels; each week returning customers share their enthusiasm for, knowledge about and recipes for the fresh and flavorful produce we make available to them. We were founded in 1995 as a hunger relief operation by a group of volunteers dedicated to growing produce for emergency food programs. Over the years, we have chosen to cultivate a larger impact by addressing community needs in the areas of hunger relief, education, and sustainable agriculture. We are guided by a larger vision in which we can help to forge relationships between people, their food supply, and the land from which it grows. This sounds very basic, yet the reality of our modern-day lives is that this is a vision that will take concerted effort to achieve. The implications for quality of life, especially for those in our communities who are less privileged, are many. The importance of a healthy, nutritious diet, including fresh vegetables, is well documented. Similarly, a connection to nature holds important benefits for mental and emotional well being for children and adults alike. The programs at Waltham Fields Community Farm are designed to offer as many people in our community as possible the chance to meet those needs. As such, we hope to be a model for other urban and suburban communities. Current programs include our Hunger Relief Program; a Community Supported Agriculture (CSA) program; our LearningGarden initiative offering workshops and multi-session programs for people of all ages; a Service Learning program; a Farmer Training program, and Community Outreach Programming. We grow more than forty different kinds of vegetables using organic production methods on 11 acres of land. Our operation is open to the public all year, and we are committed to being a resource for the entire region. Our mission is to promote local agriculture through growing and distribution practices that are socially, ecologically, and economically sustainable. We forge relationships between people, their food supply, and the land from which it grows. We are proud to have maintained a strong commitment to hunger relief/food access work since the day we were founded. Our current goals for our food access program include providing $40,000 or more worth of fresh produce to those in need through hunger relief and low-cost food access programs, expanding our Outreach Market by offering nutrition education and cooking demonstrations in addition to a supply of vegetables, working with local schools to offer our vegetables as part of their lunch program, and supplying subsidized shares in our CSA for low-income families and individuals. While we have increasingly worked on growing our own revenue-generating programs in order to help support our charitable efforts, we can’t possibly continue our mission-based work without generous contributions from individuals, foundations, organizations and businesses. Donations to Waltham Fields Community Farm are donations that directly support people in need, community-building, and sustainable land management. A number of other farms in our region donate produce to food assistance programs, but ours is one of only a handful that grow and harvest the food with the specific intent to distribute it to people in need, as opposed to giving away things that have sat around too long and don’t look good enough to sell anymore. We wouldn’t give away anything to someone who is low-income that we wouldn’t feel good about providing to someone who can afford our produce at market rates. So, all people who get our produce get the highest quality, freshest vegetables around. “On behalf of JF&CS Family Table, I would like to thank you for the vouchers you generously donated to 15 of our recipient families. Coincidently, there are 15 Latino families we are currently serving monthly who received the vouchers and were very grateful. They are struggling to make ends meet on a daily basis. A contribution of nutritious and fresh produce from Waltham Fields farm is a tremendous help for them. We are happy to host youth at the farm throughout our growing season. There are numerous opportunities to participate in group farm visits, work on a special project to benefit our operation, and/or help us with outreach initiatives. Our produce reaches hundreds of low-income individuals and families each year. Waltham Fields Community Farm is the last working farm in Waltham, an ethnically and economically diverse city located on the edge of Boston's urban core. We're so thankful to all of our supporters! Our season is off to a good start with beets, carrots, onions, peas, fava beans, cabbage and kale already in the feilds and our greenhouses starting to fill up with warm season crops for planting in the coming weeks. We have a great line up of programs and events this year, including a soil testing workshop on May 12th (get your own garden off to a good start!) and seedlng sales for the public on the 12th, 19th and 20th. Check out our full schedule on our website (www.communityfarms.org) and come on out and visit!